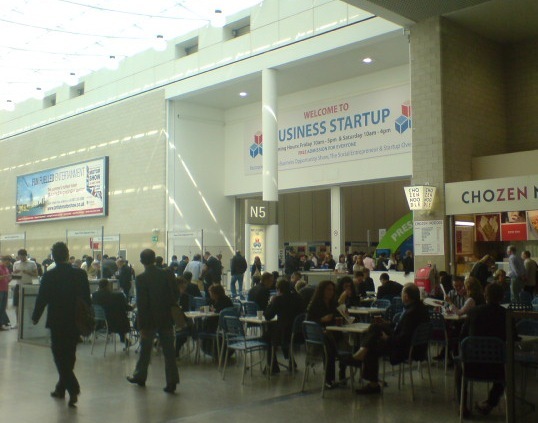 Apart from my initial earlier thoughts on I encountered at the conference, BStartup 2008 (at the London ExCeL centre) was a good experience. For brevity, I’ve summarized a few of the most relevant and interesting people and services, below. This is effectively Dragon’s Den for the rest of us. The premise was simple – you have 5 minutes to pitch your company or idea to 5 rich people, who will then decide if they want to invest in you. The gotcha is that you have to do it in front of whoever happens to be watching and the conference/audience area was fairly sizeable – I think there were at least 100 people watching the talks (and responses) on average. While it must take nerves of steel to speak in that context, especially to a large number of complete strangers, the one thing that I was very impressed with was the positivity of the potential investors. Even when they chose not to invest (which was most of the time I was watching), they were happy to dish out a lot of specific practical and pragmatic advice on how to succeed. There were no gimmicks for the camera and none of the character assassinations that you typically find in the TV editions of this format. I felt it was a very positive experience for all concerned and it seemed like a very good opportunity for anyone looking to substantially grow a reasonably established business. While I’m intimately familiar with a lot of ecommerce systems and all the associated technology and developments around it, the front-end shopping basket is not something I’ve paid a whole lot of attention to. EKM Systems Ltd, a Blackburn-based web company, have built EKM Power Shop that focuses on nothing else. If you’re looking to set up an Internet store selling anything from home-made scarves to reselling computer components, you can setup an online shop with them for just £19.99 a month, flat fee. The demo one of their guys showed me was very impressive – the speed with which you can be up and running was incredible compared to some free alternatives such as osCommerce. They also appear to integrate with just about every payment provider under the sun! Good stuff. Online accounting vendors were on every corner in the exhibition hall. I’ve been a user of an online book-keeping system for several months now, and when I signed up I thought I’d tried them all out. I was sorely mistaken! This industry sector is seeing a huge growth boom at the moment, with several accountants from across the country providing some excellent online DIY book-keeping services at good prices. The guys at Imbercal gave me a good demo and have a nifty website. My personal recommendation is Kashflow, who surprisingly were not exhibiting at the show. Apart from an excellent clean user interface, it has a phenomenal number of features. Unlike some systems, it manages to keep things wonderfully simple, only revealing extra features as they become relevant. I’m an affiliate so you can sign up for a free 60-day trial and you’ll automatically get a £2/month discount if you decide to keep using the system when your trial finishes. There were a lot of vendors selling print services, but the one that stood out was solopress. While their prices aren’t as cheap as, say, staples, the ease and range of print services available seems impressive. VentureNavigator is a free online service aimed at helping you figure out how to grow your business or to kick-start one with just an idea. Their community forum, while quiet is one of the easiest to use I’ve seen in a long time. It’s run by the University of Essex, but is relevant to anyone in the UK. Finally, I have to give some respect to Hannah McNamara for a very well-presented and entertaining talk on B2B networking. Were you at BStartup 2008? Did you find any services that you now can’t live without? Did you see any talks with amazing insights? Share your experiences in the comments area, below. This entry was posted in Events, Starting up. Bookmark the permalink. The reason we weren’t exhibiting there is because we’ve done if before and struggled to get a decent return on the cost of exhibiting (our software is very low priced after all!). That and the fact that the sales people for the space at the exhibition are a royal PITA.